In response to antigen naive CD8+, T cells differentiate into effector cells, which express Natural killer (NK) receptors, lose CD28 expression, and die by apoptosis. However, in smaller quantities, the cells are retained for subsequent exposure to the same antigen. Knowledge is limited regarding whether the percentages of CD28-, Effector memory (EMRAnull/dim), and the CD16+/CD56 + CD8+ T cells of women with low-grade cervical lesions are altered at a systemic level. We enrolled in this study women controls and women with Human papilloma virus infection (HPV-I) without associated cellular neoplastic changes and with Cervical Intraepithelial Neoplastic-I (CIN-I). Flow cytometry (FC) was performed for measurement of CD28-, memory subset, and NK-like CD8 + T cells, and IL-17, IFN-gamma, Tumor necrosis factor (TNF)-alpha, Interleukin (IL)-10, IL-6, IL-4, and IL-2. Finally, we genotyped the HPV. The CIN-I group increased the CD8 + CD28− and CD16+/56+ T cell percentage compared with that of HPV-I and controls (p <0.01), and CD8 + CCR7-CD45RAnull/dim (EMRAnull/dim) T cells were also increased in the CIN-I group compared with the controls (p <0.01). These two study groups were HPV- genotyped; 49% were HPV18+, and we did not observe differences in cytokine levels among all groups. Increased levels of CD28-, EMRAnull/dim, and CD16+/CD56 + CD8+ T cells of peripheral blood in women with CIN-I may be associated with persistent HPV infection and could exert an influence on progression to cervical cancer. Invasive cervical cancer (CC) is the second most common cancer among women worldwide, with approximately 85% of the disease burden occurring in developing countries . There is a correlation at the international level between the prevalence of the human papillomavirus (HPV) and the incidence of CC . Have been described two types of cervical squamous epithelial lesions: (a) Atypical squamous cells of undetermined significance (ASCUS), and (b) Squamous intraepithelial lesions (SIL), which including low-grade SIL [HPV-Infection associated with cellular changes ranging from non-neoplastic to mild dysplastic to Cervical Intraepithelial Neoplastic-I (CIN-I)] and high-grade SIL [CIN-II, CIN-III, and carcinoma in situ] . The primary function of cytotoxic T lymphocytes and Natural killer (NK) cells is to detect and eliminate virus-infected or -transformed cells ,. The immune response triggered by NK cells involves a complex interaction of receptors, perforins, granzymes, and CD8+ effector T cells, which recognize antigens by the T cell receptor . A productive CD8(+) T-cell response to a viral infection requires rapid division and proliferation of virus-specific CD8(+) T cells . Accumulation of CD28− T cells, particularly the CD8+ subset, is one of the most prominent changes in T-cell homeostasis and functioning in human aging. CD28, a major co-stimulatory receptor, is responsible for optimal antigen-mediated T-cell activation, proliferation, and survival . In humans, CD56+, CD161+, CD16+, CD94+, and CD57+ represent prototypical NK cell markers, although they are also found in a subset of CD8+ T cells  that are denominated by NK-like T cells ,. In humans, memory T-cell subsets can be phenotypically classified by CCR7 expression in combination with that of CD45RA . It was shown that the effector CD45RA + CD28 − CD8+ T-cell subset is expanded among peripheral blood lymphocytes in patients positive for the Human papillomavirus (HPV+) and with CC . Likewise, cytokines represent part of the complex pattern of the immune response, which can contribute to the development of cancer, as well as to combating it . In this study, we characterized the percentage of CD8+ T cells with the phenotype CD28–, CD16+/56+, and effector memory subsets in the peripheral blood mononuclear cells (PBMC) of controls and patients with a diagnosis of human papillomavirus infection without neoplastic changes (HPV-I), as well as patients with CIN-I; we genotyped HPV in both groups. In addition, we measured plasma levels of Tumor necrosis factor alpha (TNF-α), Interferon gamma (IFN-γ), and Interleukin-6 (IL-6), IL-17, IL-10, IL-2, and IL-4. A total of 79 women aged 19–60 years were enrolled in the study: 11 women without a diagnosis of cervical lesions (controls) by the Papanicolaou (PAP) test, 37 women with HPV-I with no associated cellular neoplastic changes, and 31 women with a diagnosis of CIN-I. The latter two diagnoses were confirmed by biopsy according to the Bethesda system. The mean age of female controls was 35 ± 13 years, the mean age of patients with HPV-I was 32 ± 10 years, and the mean age of patients with CIN-I was 34 ± 9 years. Women included in this study with low-grade cervical lesions had not received treatment for HPV infection and were not pregnant. The peripheral blood samples were obtained at the Hospital Regional in Ciudad Guzmán, Jalisco State, Mexico, and donors were recruited from locations in southern Jalisco State. This study was approved by the Ethics and Research Committees of Jalisco State Health Region 06 (number 02/RVI/2010) and the Bioethics Committee of the Centro Universitario del Sur, Universidad de Guadalajara (UDG), Mexico (approval number CB/001/2010). For multiparametric Flow cytometry (FC), the following monoclonal antibodies (mAb) were used: for identification of memory subsets, Fluorescein isothiocyanate (FITC)-conjugated human anti-CD8 (clone OKT8), Phycoerythrin (PE)-conjugated anti-CCR7 (clone 3D12), allophycocyanin (APC)-conjugated anti-CD45RA (clone HI100), and Peridinin-chlorophyll protein-Cy5.5 (PerCP-Cy5.5)-conjugated human anti-CD28 (clone CD28.2). For identification of NK-like CD8+ T cells (CD3+ CD8+, and CD16+/56+), we employed PerCP-Cy5.5-conjugated human anti-CD8a, alpha chain (clone RPA-T8), PE-conjugated anti-CD16 (clone B73.1), PE-conjugated anti-CD56 (clone MEM188), and FITC-conjugated anti-CD3 (clone OKT3). An isotype control was employed in each test to adjust for background fluorescence. We performed Fluorescence minus one (FMO) staining controls to establish the parameters for gating. All mAb were purchased from eBiosciences (San Diego, CA, USA) and staining was performed according to the specifications provided by the manufacturer. We added 100 μL of peripheral blood to each tube, then added 10 μL of one of the antibodies as previously indicated, according to the panel corresponding to CD28-, memory subsets of CD8+ T cells and NK-like CD8+ T cells (CD16+/CD56 + CD8 + CD3+). Cells were incubated at room temperature in the dark for 30 min; afterward, we lysed the red blood cells with 2 mL of lysis solution 1X (FACS Lysing Solution, 10X; BD Biosciences, San Jose, CA, USA) and incubated these for 15 min in the dark. Subsequently, they were washed with Phosphate buffered saline (PBS) solution and centrifuged this at 1,500 rpm for 5 min. The cell pellets were suspended in 500 μL of FACS buffer and these were then analyzed in a FACS Calibur flow cytometer (BD Biosciences). In a first tube, we performed a dot plot, analyzed size and complexity, and identified the lymphocyte region. With this region, we conducted an analysis of a histogram for CD3+, and we subsequently analyzed these cells to find (CD16+/CD56 + bright/dim) NK-like CD8+ T cells. In a second tube, we analyzed the memory subsets and the lack of expression of CD28 in CD8+ T cells from the lymphocyte region. We derived an initial histogram for CD8+ T cells, and bright cells were selected. This selection generated a dot plot with the combination of CCR7 and CD45RA markers . Cells were denominated as follows: naive (CCR7 + CD45RAbright); Central memory (CM, CCR7 + CD45RAnull/dim), and Effector memory RAbright (EMRAbright, CCR7–CD45RA+), RAnull/dim (EMRAnull/dim, CCR7–CD45RA±), and RA– (EMRAnull, CCR7–CD45RA±). Subsequently, from the same initial histogram for CD8+ T cells, we generated other histogram for analysis of CD28+ and CD28–, (see Additional file 1). For each sample, we considered the percentage of at least 20,000 events, which were acquired in a FACS Calibur (BD Biosciences). Data were processed with the CELL Quest Pro software package (BD Biosciences) and the results are reported as percentages of expression. Seeplex® HPV4A ACE screening was performed according to the manufacturer’s recommendations (Seegene). Briefly, DNA was extracted from cervical scrapes and amplified in a total volume of 20 μL containing 3 μL of DNA and 17 μL of the master mixture provided by the manufacturer. PCR was performed on a Multigene 60 thermocycler (Lanet, NJ, USA) and PCR products were stored at −20°C prior to use. Agarose gel electrophoresis was performed with 5 μL of the PCR products and 5 μL of HPV4A ACE Marker on a 2% agarose gel containing ethidium bromide. Colored electrophoretic bands were read by the naked eye and interpreted according to the Seeplex® HPV4A ACE screening user manual. We used the human Th1/Th2/Th17 Cytokine Cytometric Bead (BD Biosciences) for assessment of IL-17, IFN-γ, TNF-α, IL-10, IL-6, IL-4, and IL-2 in plasma samples from the control, HPV-I, and CIN-I groups. The assay was performed according to the manufacturer’s instructions, the samples were processed in a BD FACSAria I cell sorter, and data analysis was carried out by the BD FCAP Array ver.3 software. SPSS Software for Windows ver17 (SPSS, Inc., Chicago, IL, USA) was employed for statistical analysis. F distribution (Analysis of variance [ANOVA]) was utilized to test the hypothesis that the averages of various populations are normally distributed and that the Standard deviations (SD) of two normally distributed populations are equal. A test was used for the case of unequal variances in multiple comparison post hoc tests (Bonferroni); p values <0.05 were considered statistically significant. It was reported that CD3 and CD28 are downmodulated in CD8+ T cells during viral infection . In this study, we determined the percentage of CD28– CD8+ T cells by FC in 11 female controls, in 37 patients with HPV-I, and in 31 patients with CIN-I. We found an increase in CD28–CD8+ T cells in the CIN-I group in comparison with the HPV-I group (52.7 ± 5.9% and 38.9 ± 5.1%, respectively; p <0.01). Likewise, we observed, in the CIN-I group, a significant increase in CD28/CD8+ T cells in comparison with the control group (p <0.01) (Figure 1). Percentage of CD28–CD8+ T cells of control, HPV-I, and CIN-I groups. Controls without cervical lesions diagnosed by Papanicolaou, non-neoplastic lesions associated with Human papillomavirus infection (HPV-I) or Cervical intraepithelial neoplastic-I (CIN-I), both diagnosed by biopsy. By Analysis of variance (ANOVA) testing, we found a statistically significant difference between the percentage of CD28–CD8+ T cells in the CIN-I group compared to the HPV-I and control groups (p <0.01). Antigen-experienced T cells have been divided into CD62L + CCR7+ Central memory (CM) and CD62L–CCR7– Effector memory cells (EMC) . In this study, we used CCR7 and CD45RA for classification of the following five memory subsets of CD8+ T cells: Naive (CCR7 + CD45RAbright), CM, (CCR7 + CD45RAnull/dim); effector memory (EM) RAbright (EMRAbright; CCR7–CD45RA+) or terminally differentiated effector; RAnull/dim (EMRAnull/dim, CCR7–CD45RA±), and RA– (EMRAnull, CCR7–CD45RA–) (Figure 2). In Figure 2A, we are able to observe that 32.9 ± 16% of cells in the control group were naive CD8+ T, while naive CD8+ T comprised 23.9 ± 12.8% of cells in the HPV-I group and 18.1 ± 12.8% of cells in the CIN-I group. We observed that the CIN-I group possessed a diminished percentage of this T-cell subset compared with controls (p <0.01). We observed a decrease in the percentage of CM CD8+ T cells in the HPV-I (3.1 ± 2%) and CIN-I (2.6 ± 2.1%) groups compared with that of the control group (5.3 ± 1.8%) (p <0.01) (Figure 2B). Percentages of memory subsets of CD8+ T cells in control, HPV-I, and CIN-I groups. CCR7+ and CD45RA + memory subpopulations were classified as follows: A) Naive: CCR7 + CD45RAbright; B) Central memory: CM CCR7 + CD45RA null/dim; C) Effector memory RAbright: EMRAbright, CCR7–CD45RA+, or terminally differentiated effector; D) RAnull/dim: EMRAnull/dim CCR7–CD45RA±, and E) RA– : EMRAnull CCR7–CD45RA–. By Analysis of variance (ANOVA) testing, we found a statistically significant difference between the percentages of naive, CM, and EMRA null/dim CD8+ T cells in the CIN-I group compared with the control group (p <0.01). CM CD8+ T cells were diminished in the HPV-I group compared with those of the control group (p <0.01). Figure 2C shows that the percentage of EMRAbright or terminally differentiated effector CD8+ T cells was 15.5 ± 6.2% in the control group, 20.1 ± 11.5% in the HPV-I group, and 26.7 ± 13.7% in the CIN-I group. No statistically significant difference was found among the different study groups, although there was a trend toward higher percentages of these cells in the CIN-I group. The percentage of EMRAnull/dim CD8+ T cells is represented in Figure 2D; the CIN-I group underwent a statistically significant increase in these cells (27.1 ± 10%) as compared with the control group (17 ± 4.6%) (p <0.01). The percentage of EMRAnull CD8+ T cells was 29.2 ± 17.3% in the control group, 28.9 ± 12.7% in the HPV-I group, while this was 25.5 ± 15.1% in the CIN-I group (Figure 2E). We did not observe statistically significant differences among these groups. NK cells are classified into two subsets: the CD56brightCD16– subset, which is associated with immunoregulation, and the CD56dimCD16+ subset, which is associated with cytotoxicity. In this study, we identified two simultaneous markers, CD16+ and CD56+, for NK-like CD8+ T cells of controls and the HPV-I or CIN-I groups. We observed NK-like CD8+ T cells in 4 ± 1.7% of controls, 4.2 ± 2% in the HPV-I group, and 6.7 ± 3.9% in the CIN-I group. 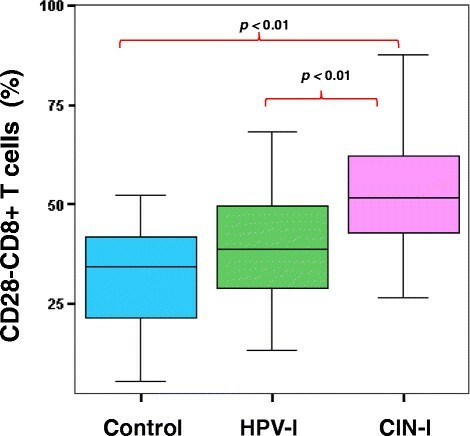 There was a significant difference in the percentage of these cells in the CIN-I group as compared with the control and HPV-I groups (p <0.01) (Figure 3). Percentage of NK-like CD8+ T cells in control, HPV-I, and CIN-I groups. To identify these cells, we used the markers CD3+, CD8+ and CD16+/56 + dim/bright. By Analysis of variance (ANOVA) testing, we found an increase of Natural killer (NK)-like CD8+ T cells in the CIN-I group compared with the HPV-I and control groups (p <0.01). HPV16 and HPV18 are high-risk HPV associated with around 70% of invasive carcinomas . Of 68 women with low-grade cervical lesions, 49% were HPV18+, 10% were HPV6+/11+/18+, 3% were HPV18+/16+, and 4% were HPV-negative, while 34% of samples were not genotyped (Table 1). HPV = Human papillomavirus; nd = not determined. We assessed the presence of Th1-like cytokines IL-2, TNF-α, and IFN-γ, and Th2-like cytokines IL-4, IL-6, IL-10, and IL-17 in serum from the different groups, identifying cytokines that were detected in 80% or more of the samples measured and whose levels had a variation coefficient of <30%. In general, we found low concentrations of these cytokines in all groups, and we did not observe differences among the control, HPV-I, and CIN-I groups (Table 2). Cytokine plasma levels (mean ± Standard deviation) in pg/mL. Controls aged 35 ± 13 years; HPV-I, 32 ± 10 years, and CIN-I, 34 ± 9 years, who were positive or negative for any HPV. In this study, we analyzed the different subset cells employing isotype controls in each sample; in addition, we utilized FMO controls in some controls because,among other reasons, isotype controls by themselves not account for fluorescence spillover from other channels. In our study, we observed that in the CIN-I group, CD28-CD8+ T cells were increased (Figure 1). It is noteworthy that CD8+ suppressor and effector T cells are also CD28-, while not all senescent CD8+ T cells are CD28-. Further, it is known that highly differentiated CD28- EM T cells, which accumulate in a variety of diseases, as well as with increasing age, are associated with immunological dysfunction and reduced responses to vaccination ,,, although senescent T cells in vitro were recently characterized as having the phenotype CD28+ CD57+ . It was also shown thatthe absence of CD28 and the presence of CD57 and KLRG1 (Killer-cell lectin-like receptor G1) are cell-surface markers of senescent T-lymphocytes in humans. These cells can secrete cytokines but have poor proliferative capacity, and CD57+ KLRG1+ cells do not express CD27, CD28, and CCR7, indicating that they are terminally differentiated effector cells . Our results suggest that in women with a diagnosis of HPV-I (HPV infection without neoplastic cellular changes) and CIN-I, there is an increase in CD28-CD8+ T cells that may be related with systemic immunosuppression, because memory T cells require CD28 co-stimulation to promote cell activation ,. This may indicate that in women with low-grade lesions and with alterations in the cervical epithelium due to HPV infection, the loss of CD28 can be promoted. Along the same lines, prior studies have reported dysregulated expression of the CD28 molecule in peripheral blood T cells of patients with advanced Cervical cancer (CC), indicating an alteration in the systemic immune response . This is important because our study shows that the deregulation of CD28 occurs not only at the later stages of CC, but also at its earliest stages (CIN-I), and this finding may aid in explaining the mechanisms underlying the antitumor immune response and immunoevasion. It would be interesting to study whether patients who later reversed their CIN-I recovered expression of CD28 in CD8+ T cells, because an increase of CD28-CD8+ T cells was associated with various diseases, and with chronic immune activation such as cancer, chronic intracellular infections, and autoimmune diseases , and because these cells are nearly constantly present and functional in human tumors, with the ability of to inhibit both T-cell proliferation and cytotoxicity ,. According to the model of naive-cell branched differentiation, the first two daughter T cells display phenotypical and functional indicators of being destined toward effector and memory lineages . Thus, in response to antigen naive CD8+, T cells differentiate, activate, and expand into effector cells, which express NK receptors, lose expression of CD28, and die by apoptosis . In our study, we observed a significant decrease in naive CD8+ T cells in the CIN-I group in comparison with the control group (Figure 2A). In contrast, no significant differences were observed in peripheral-blood naive CD8+ T-cell counts between healthy donors and patients with adenocarcinoma of the lung . Protection against intracellular pathogens or tumor antigens requires T cell-mediated responses, and it has become evident that protection against disease is linked with Central memory (CM)-type T cells . In this regard, we observed a decrease of CM cells in the HPV-I and CIN-I groups (Figure 2B). Additionally, we observed that the percentage of EMRAbright or terminally differentiated effector CD8+ T-cell subsets had a tendency to increase in the CIN-I group relative to controls and to the HPV-I group (Figure 2C). Similarly been shown that no differences existed in the percentages of effector (CD45RA + CD45RO-CD27-CD28-) CD8+ T subsets in peripheral blood between healthy donors and patients with adenocarcinoma of the lung . Notably, once the naive CD8+ T cell recognizes the antigen, a smaller quantity the naive cells is retained for subsequent exposure to the same antigen . Whereas CD45RA expression may better define senescence and CD8+ effector memory T cells that re-express CD45RA increase considerably in older humans . We found that EMRAnull/dim population is increased in the CIN-I group, which could indicate a high degree of differentiation and also represent “aged” CD8 T cells in this group (Figure 2D). We previously reported that there an age-associated increase of the Effector memory (EM), particularly the CD45RAnull/dim phenotype, in both CMV (cytomegalovirus) pp65 pentamer-positive and negative CD8+ T cells of healthy subjects . Also, we consider that these cells could be related with chronic antigenic activation or persistent infection. In addition, we observed that NK-like CD8+ T cells were increased in patients with CIN-I relative to controls and HPV-I groups (Figure 3). This suggests that some cells with the CD28– CD8+ phenotype could simultaneously be CD16+/56+, because it has been demonstrated that CD28– T cells have enhanced cytotoxicity , while simultaneously performing suppressive functions . These immunologic alterations were implicated in high-grade squamous intraepithelial lesions and persistent HPV infection , and we observed that the majority of women with cervical preneoplastic lesions were HPV18 + . We looked at whether there was systemic dysregulation of Th1, Th2, and Th17 cytokines in women diagnosed with HPV-I and CIN-I. Our results indicated that these cytokine levels were similar in all of the study groups. This is consistent with prior research that found no correlation between carcinogenic or non-carcinogenic HPV DNA and cytokine levels in women with HPV detected in cervix . However, changes in cytokine secretion or deregulation may occur in more advanced stages of neoplastic change or CC; a shift toward the Th2 cytokine profile has been observed in patients with high-grade lesions or CC ,. Phenotypic changes in CD8 + T cells in the peripheral blood of patients with low-grade cervical lesions may represent early signs of HPV infection in cervical preneoplastic epithelial cells. Thus, the high percentages of CD28-, EMRAnull/dim, and NK-like CD8 + T cells could indicate the possibility of the development of CC. The present study was conducted according to the guidelines laid down in the Declaration of Helsinki and written informed consent was obtained from the patient for the publication of this report and any accompanying images. MLP-L: Conceived of and designed the study, participated in the acquisition, analysis and interpretation of data coordination, and drafted the manuscript. PCO-L: Performed and analyzed some of the flow cytometry of cells and all cytokines and participated in discussion of the results and in the writing of the manuscript. MN-M: Performed and analyzed HPV genotyping. FS-T: Performed the statistical analysis. OP-Z: Participated in discussion of the results and in the corrected writing of the manuscript. All authors read and approved the final manuscript. This study was supported by grants from PROMEP/103.5/08 2918; Sector Funds in Health CONACyT-México no. 87993, and from the Coordination of Research and Postgraduate Studies, Centro Universitario del Sur, Universidad de Guadalajara CIP/390/08 (to MLP-L). We are grateful to L. García del Ángel, M.D., Coordinator of Reproductive Health, Health Region 06 of Jalisco and to O. Martínez-Martínez, M.D., Head of the Dysplasia Clinic of the Hospital Regional of Ciudad Guzman, Jalisco for the use of the facilities for obtaining samples from the patients included in this study. This article is published under license to BioMed Central Ltd. ; licensee BioMed Central Ltd.